WHEN hardened criminals refuse to mend their ways, they are thrown out of their areas. What a pity that Bangladeshi writer Taslima Nasreen has had to receive similar humiliation at the hands of the West Bengal government. She has been unceremoniously hounded out of Kolkata just because a mob led by Islamic fundamentalists came out on the streets against her presence and indulged in violence. FOUR years ago on November 26 India and Pakistan signed a ceasefire agreement that led to easing of tension in the border areas on both sides of the Radcliff Line. Many violations of the accord were reported in the past, but India maintained restraint. It was felt that nothing should be done that could jeopardise the composite dialogue process. SACHIN TENDULKAR’S return to form in both the long and short versions of the game is cause for cheer for all cricket fans. He has now created another wave on his relentless charge towards establishing himself as the greatest run-getter in cricket history. While his unbeaten half-century ensured a win in the first Test in the series against Pakistan, the day earlier he crossed Allan Border’s record of 11,174 runs in Test cricket. MOST people would be happy to know that the rate of inflation has come down further from 3 per cent to 2 per cent. They would also be happy to know that India’s foreign exchange reserves stand at $266.5 billion. Most of us are aware that India is gaining in importance internationally as an emerging market where foreign institutional investors are flocking every day. THE power of concentration of the two boys, studying for their postgraduation in political science, delighted me while I assisted them with their studies. If I had observed the same power for grasping and retaining any scrap of knowledge passed on among more fortunate human beings, I would have been amazed. Saturday’s unprecedented bloodbath on the streets of Assam’s capital city and the gateway to the Northeast is bound to remain an indelible black spot in the history of the state. It’s a shame on a democratically elected government that hundreds of hapless Adivasi tribals had been hounded by enraged locals and goons on the street close to the high-security Assam State Assembly and capital complex, under the nose of police and paramilitary personnel. THE pre-eminence of the Nehru-Gandhi family in the Congress was clearly evident at the recent AICC session that saw party scion Rahul Gandhi taking his place on the dias as the next link between the family and the party. Even while Prime Minister Manmohan Singh was speaking, the crowds were hailing Rahul Gandhi. WHEN hardened criminals refuse to mend their ways, they are thrown out of their areas. What a pity that Bangladeshi writer Taslima Nasreen has had to receive similar humiliation at the hands of the West Bengal government. She has been unceremoniously hounded out of Kolkata just because a mob led by Islamic fundamentalists came out on the streets against her presence and indulged in violence. The incident so unnerved the rulers that the Chief Minister and other Marxist leaders have been changing their statements about her status by the minute. One moment they say she is welcome to come back and the next they add that her having to leave the city was justified since it disturbed peace. All this is a reflection on the cosmopolitan character of Kolkata. Since the CPM action comes close on the heels of violence let loose by its workers in Nandigram, its image as a secular and liberal party stands badly dented. Ironically, she had been packed off to Rajasthan, a state ruled by the BJP, which the leftists never tire of calling communal. The Centre, too, has been pussyfooting over the issue. Since Taslima carries a valid visa, she is free to go wherever she wants to and it is the Centre’s responsibility to provide her security. The government has to decide once and for all whether it should abdicate its authority to rampaging mobs. That is exactly what has been done in the case of M.F. Husain, Salman Rushdie, the student artist in Vadodara and, now, Taslima Nasreen. Ironically, some people have gone to the extent of casting aspersions on the literary merit of Taslima’s writing. Does that mean that it is justified to be intolerant towards someone who is not a great writer? There would not be a bigger travesty. It is another matter that Taslima herself has made a puerile statement that “nothing happens to M.F. Husain, who had done so many things”. If she indeed wants something to happen to the 92-year-old Indian artist, she will only be justifying what is being done to her. FOUR years ago on November 26 India and Pakistan signed a ceasefire agreement that led to easing of tension in the border areas on both sides of the Radcliff Line. Many violations of the accord were reported in the past, but India maintained restraint. It was felt that nothing should be done that could jeopardise the composite dialogue process. But Sunday’s cross-border firing near the Line of Control in Poonch district was too serious to be ignored as it claimed the life of an Indian jawan. This is a matter of great concern. Pakistan needs to ensure that its troops deployed in the border areas desist from indulging in hostile fire. Such incidents can lead to serious consequences. Unfortunately, the Pakistan army continues to resort to cover firing to facilitate militants’ infiltration attempts. As Army Chief Gen Deepak Kapoor said during a recent media interview, there has been a spate of infiltration bids during the past two months. The militant outfits based in Pakistan have reportedly stepped up their efforts for infiltration in view of the approaching snowfall season when border crossing becomes almost impossible. There is also the fear that with the Pakistan army increasing the heat on jihadi terrorists in its areas bordering Afghanistan, the militants trained for causing death and destruction in Jammu and Kashmir may be in a better position to regroup themselves and plan their infiltration into India. According to General Kapoor, the terrorist training camps on the other side of the border are still intact. This is surprising, as terrorists have proved that they are nobody’s friends. They are giving hell to the authorities in Pakistan, threatening the rule of law. Pakistan cannot be a gainer by ignoring the activities of the Kashmir-bound militants. It must destroy their infrastructure, including the training camps, and block their funding channels. It should give clear instructions to its border forces not to indulge in cover firing to aid militants’ infiltration into India. Terrorists need to be eliminated before they succeed in nullifying the achievements of the peace talks. SACHIN TENDULKAR’S return to form in both the long and short versions of the game is cause for cheer for all cricket fans. He has now created another wave on his relentless charge towards establishing himself as the greatest run-getter in cricket history. While his unbeaten half-century ensured a win in the first Test in the series against Pakistan, the day earlier he crossed Allan Border’s record of 11,174 runs in Test cricket. While it took the Australian 156 matches to make those runs, Sachin has made it in 141. Sachin is now the second highest run scorer with 11,207 runs, behind only West Indian Brian Lara, who has 11,953 runs in 131 matches. Not so long ago, the man holding the world record for the most hundreds in Tests and ODIs (37 and 41 respectively), with 15,962 ODI runs (way ahead of anyone else), seemed woefully out of form. He was, seemingly, a shadow of the dominating player that took the cricketing world by storm, even earning the epithet of a “walking wicket” at one point. As part of the so-called ‘big three’ of seniors in the end phase of distinguished careers, speculation about his retirement and timing has been rife. But he has done well in recent ODI outings and, on current form, he will win a place in any Test team in the world. Needless to say, fans will back Sachin to get the 750 odd runs required to put him ahead of Brian Lara. It will take a few good series to do that. There are two more matches in this series. The truly tough series coming up in Australia would test the temperament and ability of the best in the team. Anil Kumble as captain has made a dream start, even winning the man of the match award. Cricket lovers can expect to see more of an in-form Sachin in this team. MOST people would be happy to know that the rate of inflation has come down further from 3 per cent to 2 per cent. They would also be happy to know that India’s foreign exchange reserves stand at $266.5 billion. Most of us are aware that India is gaining in importance internationally as an emerging market where foreign institutional investors are flocking every day. India is growing around 8.5 per cent, one of the highest GDP growth rates in the world. But certain scary items have started appearing on the horizon like the recent decline in industrial growth (currently, at 6.4 per cent from the previous 10.3 per cent) and exports are growing at half the pace as last year. The rupee has appreciated 12.5 per cent in 2007, which means imports have become cheaper and exports rather uncompetitive as compared to India’s neighbours and rivals (China’s yuan has appreciated by only 3 per cent). India’s trade deficit (exports minus imports ) stands at around $70 billion which can be considered quite alarming, but considering the heavy inflow of foreign institutional investment funds of around $11 billion this year, and the huge foreign exchange reserves, one need not worry too much. There are, however, many hidden warnings mainly on the inflation front. First, despite the Reserve Bank of India’s efforts, there is too much liquidity in the financial system. And the high interest rates, which have come about due to the RBI’s own policy of raising the repo rates (the rate at which the RBI lends to commercial banks on an overnight and short-term basis) five times in the past one year to curb excess liquidity, are in fact attracting more foreign fund inflows. At a rate of interest of around 7 per cent in India as compared to 3 per cent in the US, foreign funds find India an attractive destination even to park their funds overnight. The heavy foreign currency inflows are no doubt adding to the liquidity in the financial system and would help to stoke inflation later. An important decision of the RBI for inflation control has also led to problems in the external sector. By deciding not to interfere in the forex markets because buying dollars would mean release of more rupees in the market and adding to liquidity, the RBI let the rupee rise against the dollar. A high- value rupee is now turning out to be one of the biggest problems for exporters. It is even leading to retrenchment in certain industries (IT, textiles, auto parts), as their competitiveness has suddenly disappeared. The rupee appreciating against the dollar has led to massive import of consumer goods and even some capital goods ( reflected in the widening trade deficit) that is now affecting the health and profits of domestic industries. The lackluster corporate results last quarter and slower industrial growth also show that there is indeed some slackening of demand . Lower demand for consumer goods and consumer durables has thus been due to heavy import substitution and also credit tightening. Another decision of the government aimed at controlling inflation is of not raising the price of petrol. This is not realistic because the burden on the exchequer for compensating the oil companies for the losses borne is going to be awesome in the future. Crude prices have almost hit $100 per barrel and Indian oil companies are suffering heavy losses every day. By keeping the retail price of petrol the same as before, the government has been successful in suppressing inflation. The moment fuel prices are raised, there will be cost-push inflation. Though most policies in the last one year have been aimed at controlling inflation, the low inflation is illusory because items with highest weights in the composition of the wholesale price index (WPI) are fuel and manufactured goods-and their prices have been kept under check. But retail food prices are still not under check and are rising though certain agricultural commodities whose prices were rising fast in February 2007, have stabilised a bit due to timely imports by the government. In any case, agricultural growth and procurement of foodgrains have to be watched closely so that there are no shortages in the future harvesting seasons. Unless the buffer stocks are also adequate, there is always the risk of food prices shooting up due to mischievous actions on the part of some private traders. Raising the productivity of foodgrains will always remain important. Today even when inflation is so low, the average household is spending more (around 14 per cent according to a survey) on essential items like fruits, vegetables, cereals and edible oils. The importance of daily food items is taken into account only if we measure the rate of inflation by the Consumer Price Index the (CPI) which considers the retail prices of a basket of goods consumed by ordinary workers (both agricultural and industrial, urban and rural) as important constituents of the price index. The index has not come down much from 7 per cent in recent months. We can feel satisfied only when the rate of inflation as measured by the CPI falls to 3 per cent. Inflationary threat will remain unless there is also a control on the government’s current expenditure because a rise in the fiscal deficit may contribute to stoking inflation. At the rate at which the government is increasing its subsidies and expenditure (compensatory packages to exporters, fuel subsidy, wheat imports at a high cost) the target for fiscal deficit for this year is likely to be overshot. A higher fiscal deficit will mean an increase in governmental borrowing and a further rise in liquidity in the system through the sale of government bonds to commercial banks. The government is now trying to control the liquidity in the market with more weapons of its monetary policy and has raised the cash reserve ratio to 7.5 per cent (it has raised CRR four times before also). But all these controls may act slowly in the face of the ‘subprime’ mortgage crisis in the US which is pushing out American hedge funds to any destination which is lucrative. The result would be that foreign institutional investors may still be pouring their money in Indian stock markets in future. This means that there will have to be stronger measures than just regulating anonymous participatory notes via SEBI, the stock market watchdog. In its battle against inflation, the RBI may be inclined to desist from lowering interest rates. Very soon, the high interest rate regime will act as a big impediment to domestic corporate borrowing specially when their bottom lines are not looking good and this will lead to a slow-down in investment and open unemployment. Already credit growth has fallen sharply compared to the corresponding period last year. Instead of inflation, we should watch out for stagflation. But Sansari and Rupendra were sightless and not easily distracted while working — an ironical observation, which I felt was the silver lining in the perennially dark cloud that life was for them. Both had strong, individualistic views on all matters of consequence — with the difference that Sansari’s opinions were coloured by a basic, dark skepticism as far as the world and its luckier denizens were concerned. Rupendra had a remarkably optimistic approach towards life and living. That day we had just started a new chapter on political philosophy. As usual, the end of the discussion found us drifting into the realms of the philosophy of life. Sansari, with his usual cynicism, was questioning the meaning of life. It was on the tip of my tongue to drown his argument with its “futility-of-it-all” theme, with a counter-argument of “awareness” — of the deep blue sky, the flowers in all their rainbow hues — when I stopped myself in time, completely flustered as I groped for an alternative argument from the momentary confusion that reigned in my mind. While I was debating between words of wisdom borrowed from the sayings of Jiddu Krishnamurti and Kahlil Gibran, I heard Sansari’s wistful words filling in the pause, “I wonder if one day some scientists will invent something that will be able to make the blind feel colours”, eerily, as if he he had read my mind. Rupendra had a hearty dig at his friend with the exclamation that incurable pessimists like his worthy friend were better off without seeing what was happening around them in the world anyway, because he would only extricate the grey and the black. A grinning Sansari asked me what I would do if I was stuck with a friend like this monster who did not even allow his best friend some fond dreaming! “Turn into a greater cynic, I suppose!” I remarked, amidst laughter all around. It was a happy day in my life, when I received the much awaited telephone call at the end of their final year exams — with the news conveyed in excited half-sentences, started by Sansari and completed by Rupendra, that they had both passed the exams with grand marks. “And I was barely expecting to scrape through”, came from Sansari when they came to visit me an hour later, laden with a bag of mangoes they had purchased en route. I saw the happiness reflected on the faces of the two friends before I turned my face away spontaneously. The fellow who had sold these two trusting people the mangoes must have taken considerable time and effort to pick out each and every rotten mango he had in his stock to fill their expectant bag. I could not bear to see the ugly fruit, exposing in its ugliness the ugliest in a human being. Thousands of Adivasi agitators, including women and children, had converged at the Beltola area of the city on Saturday morning responding to the call of the All Assam Adivasi Students’ Association (AASAA). They weren’t aware of the nightmare awaiting them on the streets of the bustling city of Guwahati. The AASAA has been spearheading the movement of around 35 lakh Adivasi tribals, including ‘tea tribes’, in their demand for Scheduled Tribe (ST) status in the state. According to the AASAA general secretary Joseph Minjh, over 10,000 Adivasis had come from 15 different districts of Assam to Beltola area in Guwahati on Saturday to attend a protest meeting. The meeting was organised as part of the continuing agitation demanding ST status for the backward and hugely illiterate Adivasi tribals living in the state. The district administration had permitted the AASAA leadership to hold the protest meeting in the playground of a high school at Beltola area. There was no permission to take out a procession on the street. However over 3000 Adivasis who had come for the meeting were instigated to take to the street at around 12-30 p.m. by a section of Adivasi youths defying the wishes of the AASAA leadership. Armed with bows and arrows, sticks, and stones, all of a sudden a section of violent Adivasis went on a rampage on the three kilometre road from Beltola crossing to Dispur Last Gate along the Dispur-Basistha Road, damaging vehicles, business establishments, and private property on both sides of the road. A handful of police and CRPF personnel on duty couldn’t do anything to stop them. The section of Adivasi youths, who had paid no heed to AASAA leaders, even went to the extent of misbehaving with women on the street, much to the shock of the local residents, before they could be finally stopped by police and CRPF by using force and bursting tear gas shells. No sooner had the police managed to disperse the rampaging Adivasis, a section of locals who had remained shell-shocked witnesses to the terror let loose by agitating Adivasis for about two hours, got on with the job of an unprecedented barbaric retaliation. 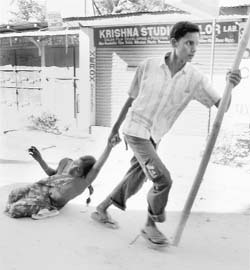 The locals armed with sticks and stones pounced upon fleeing Adivasi protestors including women. They hounded out terror-struck Adivasis from lanes and private houses. Within an hour hundreds of injured Adivasis with blood oozing from their wounds were found lying strewn all over the street and roadside ditches. A young Adivasi woman was even stripped naked by a section of goons under the public glare. Later a section of locals came to her rescue. The gory incidents were happening just under the nose of highly- inert police and paramilitary forces and no word will suffice to condemn the impotency exhibited by the men in uniform in safeguarding hapless Adivasis. It raises the suspicion that the hands of the police were tied by some vested political forces who wanted the situation to deteriorate so that a vast divide is created between Adivasis and the mainstream Assamese populace in the state. The police inaction has put the Congress government in the dock with the opposition parties led by Asom Gana Parishad (AGP) and Bharatiya Janata Party (BJP) baying for chief minister’s Tarun Gogoi’s head over the violent clashes that left one dead and over 200 injured as per official figures. The AASAA has claimed that over 20 bodies of Adivasis have gone untraced. The government has announced a Commissioner level inquiry into the incident even as it has taken punitive action against two police inspectors, so far. The chief minister has appealed to the people to maintain communal harmony and assured Adivasis that the state government was not opposed to the community’s demand for ST status and has been pursuing the matter with the Union government. AASAA general secretary Joseph Minjh said that some unwanted elements might have sneaked into the Adivasi process and sparked the violence. He, however, didn’t rule out the possibility of a section of Adivasi youths who are frustrated over the government’s lukewarm response the community’s demand for ST status, losing their patience and resorting to giving vent to their pent up anger to show how serious the community about their 60-year-old demand for ST status. He said a judicial probe be instituted to probe into circumstances and causes leading to Saturday’s mob violence. The AASAA president Justin Lakra has alleged that the violence was a handiwork of ‘agents of the ruling Congress’ which is in jitters after the AASAA announced that no political party in the state would be allowed to enter Adivasi inhabited tea estates in the state in the forthcoming panchayat polls unless ST status was accorded to the community before that. Whatever may be their post-mortem of the black Saturday, however, it was evident that AASAA leadership was not in total command of Adivasi protestors. This might be ominous for their agitation which is obviously in danger of being hijacked by militant elements within the community. The Congress, which has been banking on the large Adivasi vote bank in Assam, was in a fix when the Centre recently rejected the demand for Scheduled ST status by six ethnic communities in Assam – Koch Rajbongshi, Tai Ahom, Moran, Motok, Chutia and Adivasi (Tea Tribe) – despite a recommendation from the state government. These six communities who were promised ST status by the Congress party before the last Assembly election in the state, have now threatened to resort to intensive agitation against the government in reaction to rejection of their demand by the Union Tribal Affairs Minister P R Kyndiah in Lok Sabha in August this year. Chief minister Tarun Gogoi, who has found himself in a bind over Mr Kyndiah’s action, has vowed to take up the matter with the UPA government in New Delhi. All the six communities have threatened to form a common platform to launch joint agitation to press for their demand for ST status. In the final analysis, the shameful violence on ‘black Saturday’ that took the state populace by surprise has definitely delivered a sapping blow to the age-old ties between the mainstream Assamese population and Adivasis. Unless the leaders of both the communities show restraint and wisdom and ignore the rhetoric of politicians who are out to fish in troubled waters, the scar will not heal. When I went to get my usual breakfast cheese manouche there were no other guests in the cafe. We are all afraid. My driver, Abed, who has loyally travelled with me across all the war zones of Lebanon, is frightened to drive by night. I was supposed to go to Rome yesterday. I spared him the journey to the airport. So what can a Middle East correspondent write except that the world in the Middle East is growing darker and darker by the hour. Pakistan. Afghanistan. Iraq. “Palestine”. Lebanon. From the borders of Hindu Kush to the Mediterranean, we n we Westerners that is n are creating (as I have said before) a hell disaster. Next week, we are supposed to believe in peace in Annapolis, between the colourless American apparatchik and Ehud Olmert, the Israeli Prime Minister who has no more interest in a Palestinian state than his predecessor Ariel Sharon. So who are the A’adhamiya Knights? Who is paying them? What are we doing in the Middle East? And how can we even conceive of a moral stand in the Middle East when we still we refuse to accept the fact – reiterated by Winston Churchill, Lloyd George, and all the details of US diplomats in the First World War – that the Armenian genocide occurred in 1915? When we can’t get the First World War right, how in God’s name can we get World War III right? THE pre-eminence of the Nehru-Gandhi family in the Congress was clearly evident at the recent AICC session that saw party scion Rahul Gandhi taking his place on the dias as the next link between the family and the party. Even while Prime Minister Manmohan Singh was speaking, the crowds were hailing Rahul Gandhi. Contributions of Jawaharlal Nehru, Indira Gandhi and Rajiv Gandhi were recalled but there was probably no mention of the role of Lal Bahadur Shastri. Former Prime Minister P.V. Narsimha Rao has never been a favourite of the cheer leaders in the party. Though Congress president Sonia Gandhi indirectly admitted to her and Rahul Gandhi being the main vote catchers of the party, she said that success would come with the efforts of all partymen. With Himachal Pradesh Chief Minister Virbhadra Singh apparently keen to change the party candidate from Rampur by replacing the sitting MLA and six-time winner Singhi Ram with a former security official at 10 Janpath, party circles were left wondering if he had chosen the opportune moment to make a change. They said that had the Chief Minister dropped Singhi Ram, who is the Food and Civil Supplies Minister, during the downsizing exercise, instead of Vijay Singh Mankotia, it would not have led to the emergence of the BSP as a factor in the polls. Mankotia, who released a CD against the Chief Minister, eventually joined the BSP. Following the downsizing, which saw only ministers from Kangra being dropped from the cabinet, the BJP sought to put the Congress on the defensive by accusing it of regional bias. There is growing invester confidence in wind power generation, maintains K P. Sukumaran, adviser to the ministry of renewable energy. At a conference a few days ago, Sukumaran observed that the debate on whether wind power is viable or not has been put to rest. At the same time the private corporate sector involved in generating wind power stressed that renewable power in the energy mix must be raised to 20-25 per cent if the country’s long term energy security is to be ensured. They regretted that wind power was still at a disadvantage compared to hydrocarbon fuels. The private sector felt that the government should impose an environment protection cess on fossil fuels to level the playing field.